At a meeting in the Unionist Rooms, Partick, a new club was formed under the title Victoria Park AAC. A constitution and rules were adopted, and the following office-bearers appointed:- Hon President Jas K Crawford; President: Peter Morrison; Vice-president; R Johnstone; Treasurer: Jas Totten; Secretary: D McKenzie; Captain: DK Thomson; Vice-captain: KA Smith; Application is to be made to the SAAA for membership. What follows is an outline of the club’s remarkable progress over its first few years up to the War in 1939 with a look at the years up to 1960. It is not a history but by using results from the two big meetings of the 1930’s – the SAAA Championships and the Rangers Sports – to indicate the club’s progress. During their first season their runners were a bit cautious of racing on the track and were not present at the national championships. However at the Rangers Sports in August 1930, the Youths 100 yards featured a runner called SS Beattie who finished second off a mark of 5 yards. This same Sam Beattie would become Victoria Park’s most successful track athlete of the 1930’s winning his first track title, the 100 yards, in 1939. He also won the club’s first field events titles too with gold in the long jump in 1936, ’37 and ’38, and also in the Triple Jump in 1937 and ’38. There were also silvers in the 100 yards, Broad Jump and Triple Jump. He also seemed to like Ibrox being again second in the Rangers Sports Youths 100 yards but the handicappers were learning too and his handicap this time was only three and a half yards. The first senior man to be noted in the results of the SAAA championships was Jack Gifford who, although unplaced, gained a standard award for the one mile in 1932. He followed this with a third place in the invitation 1000 yards handicap at the Rangers Sports in August behind Watty Calderwood (Maryhill) and R Clarke of Plebeian. 1933 was the year when the first senior medal was won for the club, Jack Gifford being third in the mile. That year, in the Youths 100 yards, A Dixon ran, G Breckenridge ran in the Youths half mile, Gifford won another standard medal in the mile when he finished third. The Victoria Park sprinters were in successful action again at the Rangers Sports on 5th August. TD Naismith was second in the 100 yards handicap and H McBride won the Youths 100 yards. There were no members among the results of the SAAA championships of 1934, but several club members ran in the Dalmuir United FC Sports in Clydebank. AJF Cromarty was second in the Youths 100 yards and RK Thomson was second in the one mile in what was actually a fairly good class meeting thickly populated by members of Shettleston Bellahouston and Clydesdale Harriers. Into 1935 and JK Oswald ran in the half mile but failed to make the final, J Whyte ran in the Youths 100 yards and JA Robertson was second in the Youths half-mile in which his club mate R Scott also ran. They were now competing in numbers and at Ibrox the successes were beginning to mount up for the five-year old club. J Maitland won the 100 yards from a mark of four and a half yards beating runners from nine and a half and eleven yards. Another half miler in the shape of GR Walker was second in the half mile, and Maitland was third in the invitation 120 yards sprint. Came 1936 and not pone but two gold medals came the way of the club from Scotstoun to go with Gifford’s bronze of several years earlier. Gifford himself won the three miles described by the reports as follows: “A fine spectacular race was the three miles won by J Gifford (Victoria Park). It was veteran Donald MacLean (Maryhill) who made it a great race by compelling the favourite from Victoria Park to pull out all he knew to head the big smiling Greenock policeman in the good time of 14 min 54 sec. ” Emmet Farrell (Maryhill) was third. Sam S Beattie won the first of his senior collection when he won the Broad Jump with 21′ 9 1/2″ and although unplaced in the 220 yards he won a standard medal. There were no club men in the results at the Rangers Sports in August but the standard was very high with many English and Irish runners and they may well have been ‘handicapped out of it’ in the open events. “The judges who were set the task of deciding the destiny of the Crabbie Cup sat in consultation much longer than is usual. Eventually they agreed that SS Beattie (Victoria Park AAC) was the outstanding figure at the meeting and few can grumble at that finding for Beattie won both Broad Jump and Hop, Step and Leap and reached the final of the 100 yards. His winning effort in the first event of 22′ 2 1/2″ equalled WL Hunter’s 1914 performance which is the best ever reached at the meeting.” read the report on the SAAA Championhips of 1937 in the ‘Glasgow Herald. The Crabbie Cup is awarded annually to the outstanding performance of the meeting at the national championships and it was quite an honour for Beattie – and for the club it must be said. In the Youths events JCE Duncan was third in the Broad Jump and second in the Javelin. At Ibrox on 7th August the sprinters led the way again with RT Graham second in the final of the 100 yards and WH Collins second in the final of the 220 yards. JB Richmond won the half mile to complete the club’s haul for the afternoon. On 25th June 1938 it was another good day for Sam Beattie at the national track and field championships. In the 100 yards, he finished second to Robin Murdoch of Atalanta and Bellahouston Harriers, then retained both Broad Jump and Hop, Step and Jump titles. There was a J Gifford running for Bellahouston who was second in the Mile – I don’t know if it was the same runner as ran fro VPAAC before that – with HM Hayman of Victoria Park in third. Four medals in the championships was a good day. At Ibrox before a crowd estimated to be 70,000, in the Youths 100 yards, A Maitland was second to A Watt of Shettleston and in the 880 yards N Nelson was also second. 1939 was to be the last year before the war, and Downie was in action again and at the SAAA championships the 100 yards was a talking point with the first two from 1938 – Murdoch and Beattie – facing the starter again. The Glasgow Herald said: “In the 100 yards it was SS Beattie who defeated the holder, thus realising his ambition only a few days before he leaves Scotland for South Africa. Smarter away than Murdoch, the Victoria Park man was 1 1/2 yards ahead at half-distance, but just managed to hold his position in a rousing finish. The time was 10.3 seconds.” Beattie then lost both Broad Jump and Hop, Step and Leap events losing the Broad Jump by only one quarter of an inch. Maitland was second in the Youths 100 yards – again to A Watt. At Ibrox in August, Maitland won the open 100 yards handicap and Andy Forbes was second in the one mile, first race. There were two mile races because the entry was so large with the first being generally the quickest men. 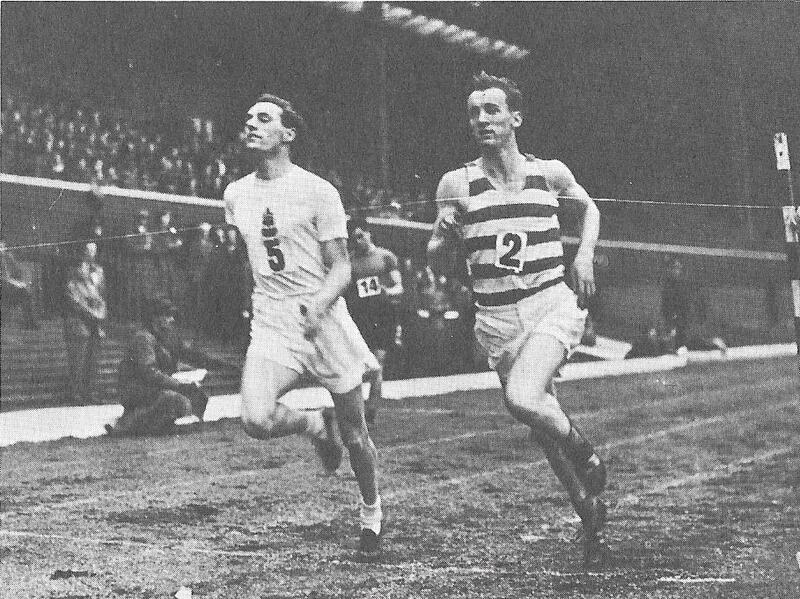 Forbes was the first Victoria Park runner to break a Scottish track record after the war when he ran 14:32,2 for the Three Miles on 5th July 1947 and was one of Scotland’s best ever endurance athletes. The club continued in great shape after the War and their endurance runners exploits are recorded here . Not only did they virtuallyt monopolise the road running scene and battle it out with Shettleston for country honours but their sprinters were magnificent, particularly over the 100 yards – see the list below – and in the high jump the club’s jumpers held the title in 16 years out of 20. But let’s go back to the endurance men and look at the exploits of the cross-country runners in the championships of the 1930’s. Over the country the club was an immediate success in terms of turning out complete teams, racing competitively and developing runners. Their ambition was apparent – the club was eighth of 26 teams in the four man District Relay Championship and then a good seventh place (of 18 entered) in the District Championships. They then entered a complete team in the Scottish Cross Country Championships of season 1930/31 at Hamilton, and it finished 15th with the scoring runners being DE Thomson, 31st, J McClare 51st, K Smith 62nd, I Brown 103rd, R Johnstone 110th and J Cascarina 130th. The clubs immediately behind them were Eglinton Harriers, Edinburgh Harriers and Olympic Harriers. Encouraged by this success, the new club entered a team for the second ever Edinburgh to Glasgow Eight Man Relay on 25th April 1931 and finished fourteenth of the 20 teams contesting the event. Runners here were K Smith, R Brown, J Jackson, JS Oswald, J Trotter, DK Thomson, J Clark and J Cascarina. Next year’s Midland District relay saw the club enter two teams which were 23rd and 25th out of 25 club entered but in the District championships themselves they were ninth out of 21 teams and a new face appeared that was to be one of the best – ‘J Gifford’ finished 14th to be second club man behind K Thomson in 13th. Smith, Oswald, Brown and Johnstone completed the team. In the National, there were no club members running either as individuals or as part of a team. There was no Edinburgh to Glasgow relay that year and the cross-country men had to wait until the start of the 1932/33 season to show what they could do. At the start of the 1932 season, the club was only two and a bit years old and had only two years experience. 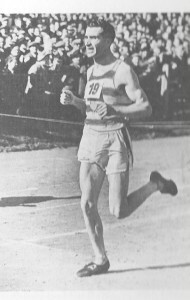 The team entered for the relays started off with Jack Gifford who ran the eighth fastest time of the day and at one point was leading the field before dropping back a bit with the others in the team, Horn, Oswald and Smith, doing well to finish in front of thirteen other clubs including such as West of Scotland, Hamilton and other established sides. In the Midland championships, they were eighth out of 24 clubs with Gifford second, almost a minute behind Flockhart of Shettleston Harriers. Minus Gifford, Horn and Oswald the team was 17th of 20 in the National and did not compete in the Edinburgh to Glasgow in April. The first of the cross-country championships of 1933/34 was the District relays. This time round Victoria Park was eighth and the runners times were more closely bunched – 14:14, 14:22, 14:58 and 14:29 – and they had a second team that finished nineteenth. The Einburgh to Glasgow was run on 16th January in 1934 and despite Jack Gifford being first on the first stage, the team finished eleventh of fifteen. The District championships were held in February 1934 and the club was eighth of the twenty clubs taking part. Fourteenth in the National in March, there was a Youths team representing the club and W Oswald 5th, W Hutcheson 8th, J Cromarty 43rd and A McKay 55th managed fifth place out of 19. District relays in 1934/35 season were again held at Hamilton and the team was thirteenth of twenty two competing but it was not an unlucky number for Victoria Park’s cross-country runners. At the District championships, on 2nd February 1935, the result must have been a surprise to all concerned – the club finished second to Garscube and nineteen points ahead of Maryhill in third. The runners were DE Thomson 7, J Gifford 10, J Oswald 19, R Rogerson 20, WD Oswald 42 and W Stevenson 58. Seventeen clubs took part in the event at Hamilton racecourse. These were the first team medals in any of the major championships to come the way of Victoria Park. There was no senior men’s team out in the national but the Youths team was third to take the first national team medals of any club team. Five years old, and they had won bronze in a national championship. The youngsters were H Hayman 4th, D Harvey 18th, J Keith 21st and W Smith 26th. The Edinburgh had been held at the start of the year again – 12th January – and the club had been seventh of seventeen teams running. 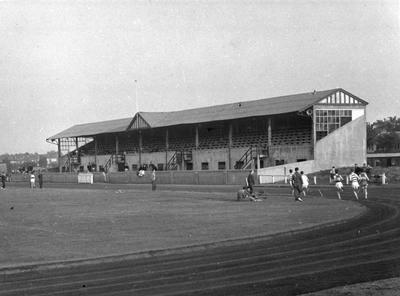 Fifteenth in the District relays at the end of 1935, the club was sixth in the District championships and , although Bellahouston had a team finishing behind Victoria Park in seventh, Jack Gifford ran as an individual finishing fifth. Eighth in the National was a good run for the team which finished in front of Garscube Harriers and Edinburgh Northern Harriers. On 4th April they were ninth in Edinburgh to Glasgow relay. Andy Forbes turned out on the first stage of the Midland relays at the start of 1936/37 running the club’s fastest time of the day by 20 seconds. The team was tenth of twenty one. Forbes led the team home in the District championships when he finished in 23rd, juts two places ahead of R Rogerson in 25th to help the club to ninth place out of eighteen. In the National when the team was eleventh of twenty six clubs, Thomson was the club’s lead runner in 38th, with Andy only fourth club counter in 88th place. The Edinburgh to Glasgow was in April again and the team was ninth of the sixteen who started the race. Season 1937/38 started with their best ever place in the relay when they finished fourth with J Linacre equal fifth fastest time. Things continued to get better when they finished second in the District championships at Hamilton, only 12 points behind Bellahouston. The runners were Rogerson 7th, Thomson 11th, Linacre 13th, Dobbie 16th, Oswald 18th and Blackstock 40th. The season continued with fifth in the National (Dobbie 11th, Linacre 20th, Thomson 37th, R Rogerson 50th, G Lindsay 60th and JS Oswald 70th. They were immediately in front of Dundee Hawkhill , Springburn, Plebeian and Edinburgh Southern Harriers in a field of 19 teams. In addition the team was fourth in the Youths race with J Thomson fourth finisher but scoring third for the team placing. In April they were seventh of the sixteen clubs in the Edinburgh to Glasgow – the event they were to dominate through the fifties. In the last pre-war season of 1938/39, they started with three teams out in the District relay finishing seventh, sixteenth and twenty first showing a greatly improved strenth in depth for the not-yet-ten years old club. Better still was to come – in the last District championship before the war, Victoria Park won the title with their six scoring runners being in the top twenty finishers. In the National the team finished a very creditable fourth – although well behind three other Glasgow clubs – Bellahouston, Maryhill and Shettleston, it was no small thing to beat every team from every other city, town, village and hamlet in the country. The club’s first SAAA 100 yards medal came in 1938 and their first title a year later – both down to Sam Downie. That was when the club’s production line of great 100 yards runners started. Beattie was without doubt the top track athlete produced by the club over the 1930 – ’39 period. His full name was Samuel Sinclair Beattie and he was a native of Glasgow having been born there on 6th December 1914. By occupation a Physical Training Instructor his best ever long jump was in 1937 when he leapt out to 23′ 7″ at the AAA Championships when competing against Lutz Long the 1936 OIlympic silver medallist. mentioned in the newspaper report above, he emigrated to South Africa in 1939 and joined the Air Force when theWar started. Beattie didn’t survive the war and was kiled in an air crash on the Gold Coast in 1943. The War interrupted the club’s progress, of course, but the list of 100 yards medallists is below, deliberately set out one below the other to show what a procession it was between ’38 and ’60. It was a marvellous start for a club which began in the Unionist Rooms in Partick. This is a quick scamper through the beginnings of the club, a proper history would be a wonderful thing and, given the information available on the internet now, a detailed statistical record could be done without too much difficulty.